A few weeks ago the Women's Running Roundup stumbled across a rather interesting lady - Mary Menon ( of Ilfracombe Running Club, though only since 2016). It was after remembering Mary's name from the top GB women at London marathon, then seeing it again as overall winner of Race to The Stones outright and shortly after that as winner of the North Devon Marathon for the 5th year running that I got really intrigued. It is finding out about people like Mary that made me want to start the Women's Running Roundup. All over the country ( and world) there are talented women who are putting the time in, training hard and getting that much sought after balance between not running just for times but also being competitive and showing that they can race with the best. It only took a swift glance at Mary's Power of 10 and the line of "1"s against her name to realise that this lady races lots and races well. So, I caught up with Mary over email to find out about her love of miles, her thoughts on women's running and where we should be looking to see her on the podium next. Congratulations on your 5th successive North Devon Marathon victory and so soon after Race To The Tower. You’re a busy lady! Just so we can get to know you a bit - When you’re not running, what does life look like for you when you’re not running? I'm 38 years old and have two children Alice (8) and Ferdy (6) I also have a long suffering husband, Ed. Essentially I am a full time Mum but I am also a part time professional equine groom. We live in a village called Exford which is smack bang in the middle of the beautiful Exmoor National Park, Somerset. 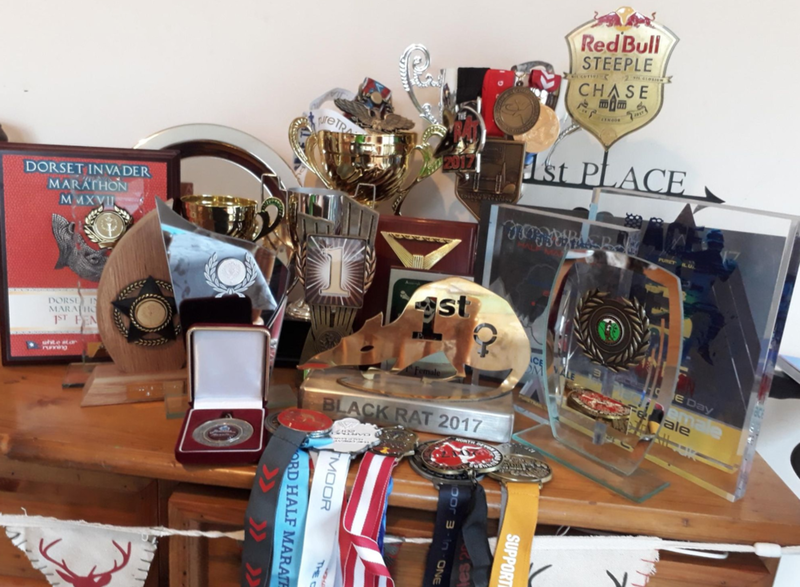 When I left home to move to Exmoor I gave up competitive racing but carried on running several times a week for general fitness and for the love of it. Once I had the children I returned to running to lose baby weight, at first running with a double pram and then when they got too heavy and I wanted to run further and off road, very early in the morning. After 18 months of running most days a good friend of mine suggested that I should run in a local 10km trail race.... At first I was dubious, competitive running hadn't occurred to me and I was lacking a bit of confidence as to whether I would be capable of it, but after a bit of thought I entered, and to my surprise managed to finish 2nd. Doing a bit of strava stalking, you’ve been logging 80-100 miles a week recently. Is that a standard volume for you and what does a normal training week look like ? I like to run fairly high mileage weeks, a lot of it is junk miles... I don't try and make excuses for this, it isn't very scientific but I live in a beautiful part of the country and get a lot of enjoyment from running in a different direction most days of the week. I tend to keep plenty of ascent in my training to make up for a lack of speed work and always train with my running club (Ilfracombe Running Club) every week. I do some core, weights and hiit training everyday and use the spin bike as a recovery tool aswell. How do you handle running races so close together? Is that something you consciously schedule or did it just happen through enjoying racing and signing up to lots of them? I like to race a lot of different distances and terrain, from 2 mile inter club relay distance on tarmac to ultra distance along the coast path... I think they all complement each other to make me a stronger athlete. And there are so many great races around that I love to run and can't resist. You really seem to be finding amazing form at the moment, does it feel like that to you and is there anything you attribute it to? Did you go into the year with any specific goals? I have been able to keep in good form for some time now, cross training has, in my opinion been a major factor towards this and also just keeping it cool... I go for a run, not sweat it out doing a particular item of training from a running schedule everyday. Every year I have a particular goal in mind, last year was the 'putting it right year' where I revisited a couple of races that hadn't gone so well before and gave them another go. And this year was the 'ultra year' where I would have a go at a grown up sized ultra race. Winning the Race To The Tower overall gave me a great deal of satisfaction, entering this race hadn't been taken lightly, it was carefully considered for a 'toe in the water' to perhaps more ultras in the future and I thoroughly enjoyed it, ultra running seems quite tactical where playing a long game is very important. What you do in the first 10 miles (nutritionally, mentally or physically) will be very important in the last ten miles. The race couldn't have gone better, I kept in good spirits and felt strong throughout, taking the overall lead at mile 34 and gaining distance over the other runners from then on. That was until 5 miles from home where a marker arrow had been twisted round... and no others were in sight. I went from coasting toward the finish well in front, to running up and down a steep track in a panicky way desperately trying to find a marker for half an hour until the 2nd and 3rd placed runners both turned up on the wrong section aswell. I had already run an extra 2 miles by that stage, fortunately Greg (who came 2nd) had the gpx file on his watch so we could navigate back to the race route. As I was running up the final hill, 200m from the finish Greg re-caught up with me and assured me that the race was mine as he knew that if the course markers had been correct, we would not have come across one another. In a true act of sportsmanship he let me cross the line first. What do you think are the challenges or advantages of being a competitive female runner? I think there are some distinct advantages to being a competitive female runner in a mixed race, the men generally don't view me as their competition so I can benefit from their pacemaking without being a threat to their placing. How do you juggle family life and running? You run in a beautiful part of the world, what’s your favourite race and do you travel much for races? How do you choose which races to run and do you have any bucket list races? I live on Exmoor and it is an amazing place to run, it would be very rare for me to run the same route twice in a week. My favourite race isn't very far from home, it is the North Devon Marathon at Woolacombe. This was the first marathon that I ran, 5 years ago (I have run 30 marathons since then) I loved it, won it and have been fortunate to return each year since then to win again. The route is predominantly along the southwest coastpath and is breathtakingly beautiful. I race fairly locally, within a two hour drive from home generally. Mainly because of the children, I don't want to be gone from home for hours on end and equally if Ed and the kids come to cheer me on I don't want to have bored them to death with a long car journey first. Also there are plenty of races around to fill my year without going too far afield. There are of course some exceptions... Now we are all a bit older and not so wild (adults and children) we have stayed away from home for a night before the odd race so I am beginning to widen my net. For example, RTTT, London Marathon and the odd race in Dorset and deepest Cornwall. What excites you most about running ( either for yourself or the sport in general)? I love that running is becoming so popular generally, I used to be the only runner in the village but not anymore and that excites me for the future of the sport, there are so many genre's of running and races and it really is open to everyone, all that's needed is a pair of trainers.... And away you go, there's not really a right or wrong way of doing it. What would be your top tip or words of wisdom to other runners? If I was going to give any words of advice it would be to remember to enjoy yourself at whatever level of running you're at, it's meant to be fun.... That's the point. My practical advice would be to always take a snack for a long run, even if you don't think you need it, you will even if you don't realise until afterwards! I have a July of local 10km races, after some fairly hefty long races I think I need to reintroduce some pacier efforts so I shall give these a go. finishing off the month with a marathon in Dorset. My next big event is a 32 mile race in Cornwall at Mudcrew's R. A. T. event in August. Anything else you wish you could say to runners or want people to know about? Mary's next races will be: Haytor Heller 10k across Dartmoor on Saturday 21st, followed by the Dorset Invader marathon on the following Saturday 28th. Mary has won the Dorset Invader for the previous 2 years and is wonderfully open in saying that she's going for a third! It's not just the WRR who have clocked Mary's amazing feats, as Fast Running pipped me to the post in publishing an interview with her. It's so exciting that a big website like FR are highlighting Mary's achievements and as you'll know, I'm a big fan of their work (especially that of Ruth Jones) so please to go and read their interview too. Hurrah for FR!